MISSION: IMPOSSIBLE- GHOST PROTOCOL – Premiere Photos! The new release of the successful franchise, “Mission: Impossible- Ghost Protocol” recently did a press tour where the Paramount Pictures film was premiered in countries- Korea, Mumbai, Australia, and Japan. A recent video released from the studio has director of the film Brad Bird stating that an early release of the movie in the U.S. will open in IMAX five days before its wide release! See some of our favorite photos below! Tom Cruise at MI Ghost Protocol premiere in Korea. MI screening in Korea. Pictured: Tom Cruise, Paula Patton, Brad Bird. Paula Patton at MI Ghost Protocol screening in Mumbai. MI press conference in Korea. Brad Bird, Paula Patton, Tom Cruise. Paula Patton at MI red carpet in Korea. 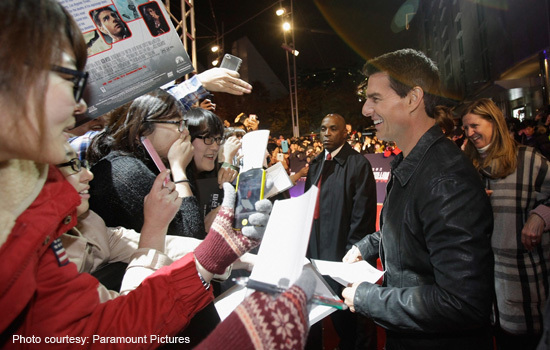 Tom Cruise signs autographs at MI premiere in Korea.